Lori here from ScrappinMyStressAway! This week's theme at Sweet Sassy Diva's is Hidden Journaling. I love hiding journaling on my page so I can fit more pictures!! I received this Christmas card from my Aunt Chris and just LOVED it! My first thought was this could be a title for a layout! I grabbed some papers from this paper pad. These papers were my favorite for this project. I lined the card with the green paper and then white cardstock to give me space for my journaling. I used Winter Frolic and gold cardstock for my embellishments. I welded 3 ornament borders (top) sized to 2.14 inches and (bottom) 1.80 inches. I cut out the Phrase Making Spirits Bright at 2.24 inches. I cut out the tag at 3 inches and the ornament balls at 2.88 and 3.12 inches. I needed another picture here and really liked this photo of me, but not the red bow on my head! So I covered it up with this ornament border! I trimmed the bottom of the green page (Santa sack and toys) and adhered it to the bottom of this page. This page was a fun collection of photos of us being techy on Christmas Eve. My niece is playing on my tablet. My son is teaching my Sister-In-Law how to play Hangman with Friends on facebook with her friend (and my other niece joining in on her ipod touch). My SIL is also teaching my youngest how to play games on their tv. I added some sheer gold ribbon for some texture. Here is my hidden journaling with an ornament border. Welcome to Day 2 of the Cricut Friends Blog Hop! If you are looking for Scrapbooking SOS 1st Blogaversary Hop, please go HERE. If you are looking for my project from Day 1 of Cricut Friends Blog Hop, please go HERE. Here is the entire line up in case you found me first or get lost along the way. Don't forget to comment on every post in the hop in order to qualify for the Blog Candy!! I wanted to make a special layout about Tanner rollerskating. This is his kindergarten year and his first time going to skating parties. The first party was very difficult for him and I. Those roller skates are not easy to use!!! We went out and bought our own rollerblades. I moved some furniture in the basement kitchen (my day care kitchen) and we practiced quite a bit. He is now skating without me at the parties and I am so proud of him. I love skating, but it can be dangerous with all of those kids!!! For this layout, I used Nifty Fifties for the roller skate title. I sized it to 2.61 inches. I also cut out the roller skates but decided not to use them. I used Elegant Edges for my circle photo mat sized at 5.59 inches. I rotated it on my mat to conserve my paper. I welded three circle borders together and then sized them to be 11.60 inches WIDE (1 inch tall) to use as a page border. I cut these out of black cardstock. I put the layers to my rollerskate cuts on another Layer and cut them out in White, silver and black cardstock. I trimmed the photo down to fit the mat and adhered the title together. I wanted to keep this layout simple to showcase Tanner's art. The most important piece is the picture Tanner drew at school of his rollerblades. Part of scrapbooking is recording some of his pictures that he draws me! What is your favorite non-photo item to scrapbook? Your next stop in the hop is Mindy. Welcome to Scrapbooking SOS's 1st Anniversary Blog Hop! 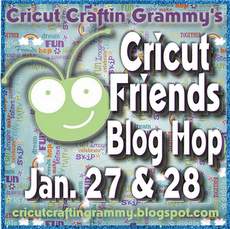 If you are looking for the Cricut Craftin Friends Blog Hop, please go HERE. You should have arrived from MARY. If you stopped here first, please go to the BEGINNING so you don't miss anything!! I made a Magic of Winter 8x8 shadow box for my project today. I used vinyl for the the phrase and cardstock for the snowman and banner. I found my shadow box at Michaels. When I use vinyl, I like to make the most of my cuts. I have vinyl for a total of 5 projects on my Gypsy Mat. When I cut vinyl, I set my Expression to 3-3-3 (blade depth, speed and pressure) for a kiss cut. This means I don't cut through the paper backing. I use clear contact paper as my transfer tape. Just make sure to de-stick it a bit on your pants first! Here are my cuts. For this project, I used "the Magic of Winter" phrase from Winter Woodland sized at 5.27w x 3.47h. If you want to see some of the other projects with these vinyl cuts, you can go HERE. I placed the phrase up high so the snowman would be seen. I used a piece of glittery snowflake paper as my background. I cut out this snowman from A Child's Year in white cardstock. I cut it out at 4.88w x 3.71h and pop dotted it on my cardstock. I wanted a little something in the corner and decided to hang a mini banner. I used Birthday Bash for my banner pieces and cut out the pieces at 1.35 inches. I used Calligraphy Collection for the font and cut the letters at .92 inches. I adhered the twine on the shadow banner flags and sandwiched them in between the layers. I adhered the top banner flags on and my banner was complete. I added some stickles on the bottom of the paper to make the snow sparkle. I also added some red stickles to the snowman and little boy. I pinned the banner in the corner and added some gems to the flags. I added some white tulle inside the shadow box to mimic snow. I tied a sheer white bow on the top and used glue dots to hold it in place. Thanks for stopping by today!! Your next stop is Pattie! Welcome to Cricut Craftin Friends Blog Hop! I am a Sweet Sassy Diva Friend to Suzanne!!! You should have arrived from Shawnee! I recently went to an all day crop and got my son's album caught up. It was great to get caught up, but I did not have my camera to take pictures step by step. He is a high school junior and I have a hard time with his pages at times. I do a lot of baseball, bowling and tennis pages (aka boring) and try to keep them plain (also boring). This photo was taken this year of my three boys and I just loved the colors. I grabbed my Gypsy Girl and created my title by welding the word Brothers from the shadow font from Batman. I sized the letters (shadow and regular letters) to 1.71inches. The word three is from Graphically Speaking and is sized to 1.47 inches. I needed a little more fluff, so I added 3 amigos sized at 2.53 inches and Certified at 2.18 inches, both from Graphically Speaking. I cut everything out of black cardstock except the regular letters. I used a lavendar cardstock for those. I added a purple border behind my photo and adhered it all together. This is my end result. A little plain and not fancy ~ perfect for a 17 year old boy! I am surprised I got away with the purple paper (he he)!! Your next stop is Mindy!! This week at SweetSassyDiva's our theme is a Scene. I created a Pumpkin Patch Scene 2 page layout. Every fall, I take my daycare kids to The Bellevue Berry Farm and Pumpkin Patch near my house. We look forward to it every year! This layout took me 3 days and (merging) two different ideas to complete!! I changed my mind so many times I lost count! I started with this hill from Pop Up Neighborhood (found in the Accessory Function) sized at 5.00h x 11.49w. I copied a second scene and flipped it. I opened up a new Layer and took the shift layer of the Accessory Function and put the hills on my mat twice. I flipped the second one. I opened another Layer and put the Accessory Layers on it twice. This was the trees and trunks. I flipped the second layer. I positioned the pieces on my mat by color for easier cutting. Once I cut out the hill layer (without the trees) and set them on my workspace, I thought there was too much sky showing. I cut another set of hills. I needed some other pieces for my Pumpkin Patch, so I opened up an old file that I started but did not use. I tried to cut the wheat from Pop Up Neighborhood, but as you can see below the paper tore. I liked the barn, pull cart and the tractor. I thought I might use the pumpkins but changed my mind. I went back to my first file and added these pumpkins from Pumpkin Carving. I welded two sets together (sized at 1.24 inches) to make a large border. I grabbed the cart and campfire from Old West, but ended up not using them. I found the Pumpkins from Chic and Scary and sized it to 6.32w x 2.18h so it would fit across the top of my 4x6 photo. I journaled on the hay in the cart. I pop dotted the barn and some of the pumpkins. I added twine across the bottom. I filled in the pumpkin border with some additional pumpkins. I used some lime green stickles to color the stems on the pumpkins. I have been saving this cloud paper for some time ~ glad I finally got to use it!! Thanks for stopping by! 2011 Layout ~ What a Year!